← Tsar Was "Man In Iron Mask"
The nurses at the hospital slowly noticed there was something quite refined about this Miss Unknown. It began to be suspected she could be a member of the Russian royalty. It eventually emerged that the woman was identified by some as the Grand Duchess Anastasia. 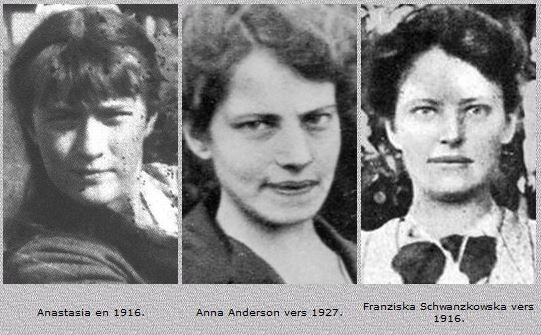 The Anna Anderson case dragged on interminably through the German courts. In 1958, one of the courts examined “evidence” brought forth by the Franziska Schanzkowska cabal. Photos were produced which seemed to support their cause. However the chief judge quickly noticed that one of the photos had been altered. The photos were sent to the Hamburg Police Department. Their experts concluded a key photo had had alterations done to it after it had been taken. In other words, the photo “evidence” had been “photoshopped”. “Anna Anderson”, Wikipedia, October 2, 2014. This entry was posted in Anna Anderson, Franziska Schanzkowska, Romanov family. Bookmark the permalink. Franzisca was not recognized as Anastasia by any nurse. She herself told nurse Thea Malinovsky in 1921 that she was the Grand Duchess. She modeled her story on Mlle. Berditch, the first false Anastasia. Later, in the beginning of 1922, a fellow patient, Clara Marie Peuthert, thought that she was Tatiana. She actually looked a little like Tatiana, but was too short to impersonate her, so she had to stick with Anastasia. 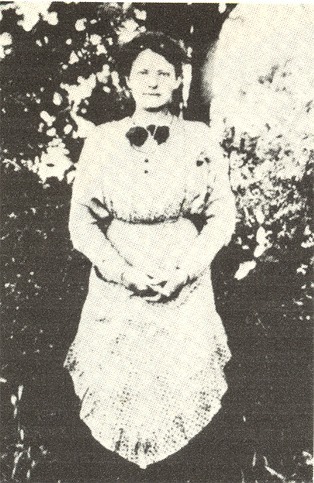 When her brother Felix saw her stepping out of the car, he stated that “that is my sister Franzisca”. But after talking to her, he decided to ” let her go on with her career.” Her sister Gertrude did also recognize her and testified against her in the Hamburg trial. Altogether seven anthropological tests were done on Franzisca/Anastasia. Five came out against her, two came out in her favor. Prince Ernest never asked her any “tough questions”, they came in writing from prince Sigismund. And the answer to two thirds of them could be found in two books. Franzisca spent five days trying to answer them, but did not manage to get them all right. The Franzisca “canard” was not invented by Ernest Von Hesse. The instigator was Doris Rosa Wingendef, the daughter of Franzisca’s landlady, who recognized a photo of Franzisca in “Die Woche”. She went to die Nachtausgabe and sold them her story. Martin Knopff was then brought in to verify her story, which he did. He delivered his findings to the duke of Hesse, who in turn gave it to the Darmstadt police. They sent it on to Berlin, and after a short investigation, the Berlin police accepted the identification of Franzisca and closed the case. See Police Von Anfang und vom June 2 1927 in Hamburg, under Bln, ZK 83 Tchaikowsky, 72, 72R, 75. Again, I am amazed at your ignorance. In addition to Franziska’s brother, her sister Gertrude screamed at their meeting that she was her sister and demanded that Anna admit it. I can’t understand how anyone could think she was Anastasia, she looks absolutely nothing like her. Anastasia’s mouth was thin, with a cupid top lip, while Anna’s is wide and thick. Anna’s eyes are bulgy, while Anastasia had a low brow. How Anna fooled those who believed she was Anastasia, especially those in the Russian royal court, and her relatives, defies explanation. How could she know so many intimate details of Anastasia relationships with her family, of the murders, etc.?? The lady named Anna Anderson did not look like the Grand-Duchess Anastasia, her features are different. No doubt that she was a member of the royal family, most probably Tatiana Romanova. Both faces Anna and Tatiana are similar in every details. One problem with that is Tatiana was of tall and slim stature, and Anna Anderson was short. She was definitely not Franziska. Franziska’s shoe size was 3 sizes larger, and she was a good 4 inches taller than Anna. Plus, her family members later said they were bribed and pressured to recognize her when they knew it was not their sister. Whoever she was, she was a lady of society – not a Polish factory worker. The nonsense about the shoe size, is pure hearsay and nothing else. The same is the case with the height. The truth is, nobody remembered or knew the exact height of Franzisca, and since she loved wearing high heels all the time, she came across as taller than 5’2″. The family members stated nothing of being pressured to recognize her, they identified her from the photo of Anna Anderson right away, but when the story of her pretense was made known to them, they distanced themselves from her, afraid they might be responsible for her canards. And after Felix had identified her as his sister, and then denied it in order to make her continue her ‘career’, the family backed him up. Only Gertrude did not manage to keep quiet. As for being a lady of high society, we have several witnesses who stated that Franzisca was ‘vulgar’, someone who ‘tried to be a lady, but did not succeed’ and ‘anything but a lady’. Also, she was not a Polish factory worker, she was a German woman from West Prussia who happened to work some time in the AEG factory. She also worked as a maid, a waitress and a farm laborer. The right description of her is a German woman from the working class.